Personalized marketing requires the right mix of message, time and channel. Impossible? Not if you gear up for it. 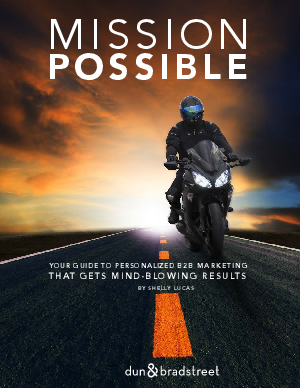 Our “Mission Possible” guide introduces a slick way to get personal with B2B buyers – without self-destructing your marketing operations. Do it right. Prioritize what you do based on the payoff and get 5 to 8 times the ROI on your marketing spend! Get your guide now.